If you’ve ever thought of writing your first non-fiction book, this may be the perfect time to accomplish that goal. Online publishing platform’s like Amazon’s KDP makes getting your finished product out into the marketplace a snap. 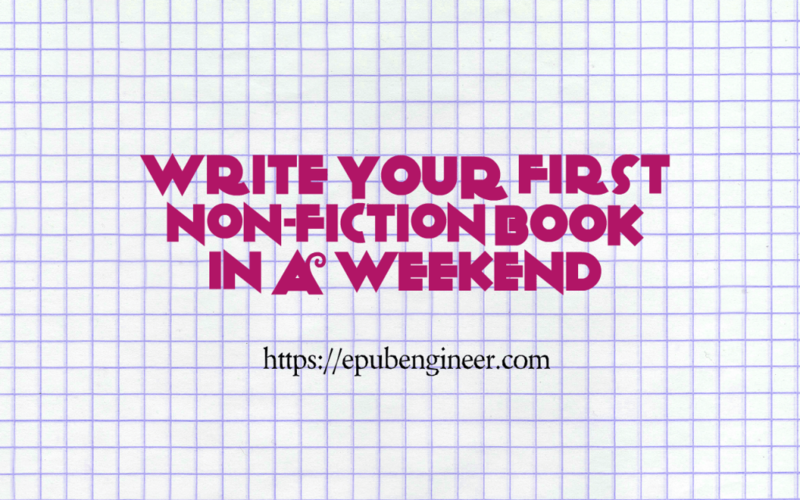 In this post, I’ll give you an overview of what it takes to write your first non-fiction book in a weekend. I’ll also give you suggestions for the types of non-fiction books you might consider writing over your next available weekend. Yes, you really can write your first non-fiction book in a weekend. In terms of criteria, Amazon, for example, prefers that short ebooks (aka Kindle books) have a minimum of 2500 words, but that is a guideline. You may have run across Kindle books that have fewer words and are acceptable. The amount of time you spend in research is dependent upon a couple of factors. If you already know the topic you want to write about well enough to sit down and start writing about it, your research time is cut considerably. You don’t need research to choose a topic and you may need only minor research (if any) in order to write about your topic. It’s advisable to choose as topic that people are reading about already, but if this is your very first book that is not as important as getting your book written. I personally prefer to write out in longhand, but you may prefer to type directly into a computer. Either is fine, although you should know that in order to publish your finished book online, you’ll need to have the completed book typed into a Word document, or equivalent. Now lets look a little closer at each one. Possibly the fastest type of book to write is the quotation book. A good way to approach this is to come up with a list of 25 – 30 quotations that are favorites of your, or, that you see yourself writing an opinion about. For best results, use one of the above three description styles consistently throughout your book. Another easy-to-put-together book is the list style. Amy had a specific goal to take notes for one year and then compile them into a list for publishing. But you can easily compile a list in a weekend sitting. In the example above, each chapter could represent one mistake. Remember that your word count goal is a minimum of 2500 words, so keep that in consideration as you develop your book’s premise. Keep your chapter titles short to make the table of contents easy to scan. Also known as the step-by-step, this books practically writes itself as you proceed to jot down a simple set of instructions explaining how to do something. To produce this type of book quickly, hone in on a task or project that is completed within a framework of 5 to 8 steps. Each step becomes a chapter with a complete written description. Adding an image or two may add clarity to a step in your process. Including a list of resources or tools needed is a good idea and include any time constraints, as they are applicable. Finally, you may also include how to ensure optimum results or describe multiple optional outcomes, as applicable. Choose one of the three above non-fiction book styles and get ready to write!